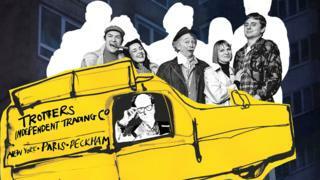 There is much to like about Only Fools and Horses The Musical: the premise, the songs, the optimism. The revolving set is good, too - moving the action seamlessly from the Nags Head Pub to the Trotters' high-rise council flat in Peckham, South London. It's all cushdy, as Del Boy would say. The only snag is it's also a bit like his famous yellow, three-wheeled motor; as in it occasionally misfires and never really gets going. That might be because the show isn't properly run in, and needs more time to warm up, but the night I went it lacked the horsepower required to turn a long-running television sitcom into a memorable night at the theatre. There is a sense of watching a group of talented Only Fools and Horses super-fans going through classic routines from the TV show (Del Boy falling through the bar, Rodney trying to explain to Trigger that his name is not Dave, and so on) without ever fully owning their stage adaptation. The impersonations are all excellent, but for it to work as a piece of stand-alone musical theatre, the performers need to move beyond paying homage to a much-loved series and have the confidence to inhabit the characters and make them live in the present. I don't really care if Tom Bennett's Del Boy sounds like David Jason's or if Ryan Hutton employs the same mannerisms Nicholas Lyndhurst used when he played Rodney. What matters is the chemistry between the two actors and their ability to match Jason and Lyndhurst by becoming a memorable comic double act. They are not helped by the show's opening, which sees Bennett spraying around famous Del Boy quotes like some of that knock-off perfume he flogs. "This time next year we'll be millionaires... He who dares wins," and Rodney's "two GCEs" fill the air with the faintly stale aroma of nostalgia. It perks up with a lusty rendition of the programme's theme tune Hooky Street, at which point the cast relax and the show starts to find its feet. The story compresses more than 20 years and 60 episodes of the show into a two-hour tale in which Rodney and Cassandra (Pippa Duffy) are making wedding preparations, Boycie (Jeff Nicholson) and Marlene (Samantha Seager) are trying to conceive, and Del Boy goes to a dating agency looking for a "sort" and ends up with Raquel (Dianne Pilkington). The original series was written by John Sullivan, whose metier was the television sitcom (Citizen Smith, Just Good Friends). Only Fools and Horses was his masterpiece, a combination of the best of The Phil Silvers Show and Steptoe & Son, with characters drawn as well as a Michelangelo sketch. In 1996 a single episode was watched by 24 million people. Sullivan died in 2011 having mulled on the idea of a musical version. In 2015 his son Jim found an outline for an opening scene, and then happened upon a cassette tape made by Chas and Dave singing a song co-written by his father called This Time Next Year. Lovely jubbly. Paul Whitehouse was approached to help write the script and Only Fools and Horses The Musical was born. Whitehouse ended up doing much more than write the script. He collaborated with the late Chas Hodges on some numbers, wrote others in their entirety, and took on the role of Granddad in the production. All of his contributions are worthy of Sullivan's legacy. The song Where Have All the Cockneys Gone, co-written with Hodges, is a high point as it morphs into Any Old Iron. And giving Trigger a crystal ball in which to gaze and see gentrified Peckham of the future full of artisan shops instead of dodgy fly-pitchers provides a welcome break from the sentimentality. As does Del Boy receiving a going over by a couple of local faces. The jokes come thick and fast. Some land, such as Del Boy telling his dating agent that "he's been engaged more times than a switchboard". Others fall flatter than Rodney's stag night, most noticeably when Del Boy has a crack at topical humour, declaring knowingly: "We're all part of Europe now. We're all one big happy family." Television and theatre are very different mediums. You can't simply transplant one to another and expect the operation to be a success. Hence the introduction of the musical element. But too much of the production is a lift from the TV series without the benefit of the cutaways, close-ups and shot changes to capture the comic nuances of John Sullivan's scripts. It is possible Only Fools and Horses The Musical will settle down and find its feet as a theatre show, but right now it is a lovingly constructed, professionally produced tribute show that fails to live up to the original.